Every day, over 50,000 community water systems serve treated (finished) drinking water to over 300 million Americans, while almost 45 million rely on private wells for some or all of their water. The availability of safe drinking water is vital to public health, but contamination can occur and treatment, storage, and distribution systems can fail. When one or more happen—especially at the same time—the result can be a drinking water-associated disease outbreak. And according to the US Centers for Disease Control and Prevention (CDC), the leading cause of outbreaks remains inhalation of Legionella bacteria (legionellosis), Public Health Enemy #1 in US Water Systems. During that period, a total of 42 drinking water-associated outbreaks were reported, accounting for at least 1,006 cases of illness, 124 hospitalizations, and 13 deaths (see Figure 1 below). Once again, Legionella was the most common cause of reported outbreaks, accounting for over half (57%) of outbreaks and all of the deaths during the most recent assessment period.3 Together, chemicals/toxins and parasites accounted for 29% of outbreaks and 79% (788) cases of illnesses. 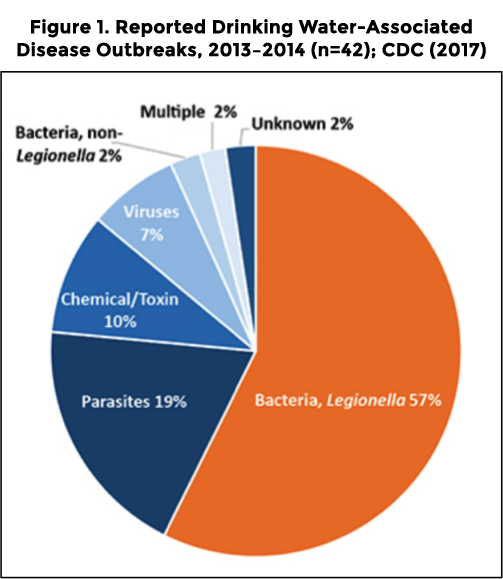 Notably, eight outbreaks caused by parasites resulted in 289 (29%) cases, of which 279 (97%) were caused by Cryptosporidium and 10 (3%) by Giardia. Chemicals or toxins were implicated in four outbreaks with 499 cases and 13 hospitalizations—including the first reported outbreaks associated with algal toxins. Nevertheless, it is important to recognize the limitations of the WBDOSS system, including the fact that individual cases of waterborne illness can occur sporadically, or as part of outbreaks of illness that go unreported. Figure 2 summarizes information on water system deficiencies associated with outbreaks in 2013–2014. Using available data, each outbreak is assigned to one or more deficiency classifications. For example, for outbreaks caused by Legionella, the bacteria were identified inside building (“premise”) plumbing systems. 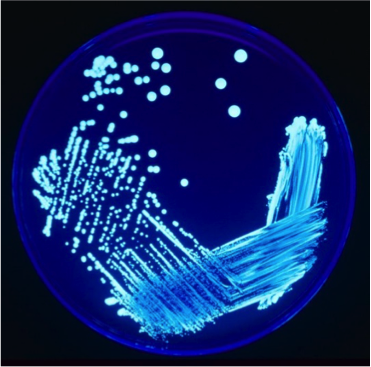 Although Legionella can cause a form of potentially deadly pneumonia (Legionnaires’ disease), it can also cause a milder form of a respiratory illness (Pontiac fever).4 Both illnesses can result from inhaling water mists or vapors from hot water systems contaminated with Legionella bacteria, as well as decorative fountains and cooling towers. It is important to emphasize that neither Legionnaires’ disease nor Pontiac fever is directly associated with the ingestion of drinking water, but is typically associated with the inhalation of mists or vapors via hot water plumbing (e.g., showering) in which biofilm, scale, and favorable temperature can foster growth and proliferation of Legionella. In contrast, most disease outbreaks of acute gastrointestinal illness (AGI, which causes severe diarrhea) are caused by consuming drinking water directly that is contaminated by pathogens in systems with low or no chlorine residuals. New research that evaluated an outbreak of Legionnaires’ disease that killed 12 people and sickened at least 87 in Flint, Michigan, in 2014 and 2015 found “During the crisis, as the concentration of free chlorine in water delivered to Flint residents decreased, their risk of acquiring LD increased.” Mounting concerns with Legionella are spurring state-level efforts to increase the chlorine residual to reduce the risk of these outbreaks. Regulated by the Safe Drinking Water Act, and supported by a network of federal, state, tribal, and local governments and utilities, the US drinking water community is widely recognized as providing one of our nation’s most significant public health advances. But when outbreaks occur, the analysis of details helps in understanding the root causes of the outbreaks and in reducing the risk of future occurrences. Effective water treatment and regulations, in conjunction with the rapid detection, outbreak reporting, and identification of the cause(s) helps protect public drinking water supplies and advances the quest of reducing the risk posed by the transmission of pathogenic microorganisms and harmful chemicals and toxins. 1WBDOSS was initiated in 1971 as a partnership between the CDC, the Council of State and Territorial Epidemiologists, and the US Environmental Protection Agency. Although initially designed to collect data about US drinking water outbreaks, WBDOSS also covers outbreaks associated with recreational water and other non-recreational water exposures. 2CDC. 2017. Surveillance for Waterborne Disease Outbreaks Associated with Drinking Water — United States, 2013–2014. https://www.cdc.gov/mmwr/volumes/66/wr/mm6644a3.htm. 3Although outbreaks of legionellosis are reported through WBDOSS, it is a nationally notifiable disease. 4CDC. 2018. Legionella (Legionnaires’ Disease and Pontiac Fever). https://www.cdc.gov/legionella/.